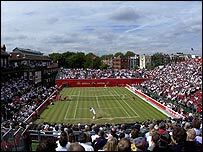 Hawk-Eye will make its grass-court debut at Queen's Club in June at the renamed Artois Championships. Andy Murray, Rafael Nadal, Andy Roddick and Lleyton Hewitt will be among a strong field for the Wimbledon warm-up event in London from 11-17 June. And the players will be able to use Hawk-Eye video line-calling for the first time at a grass-court event. Two large screens will be erected on the Centre Court to allow spectators to see line calls being questioned. Event director Tim Hunt said the decision to introduced Hawk-Eye was only taken after 18 months of trials at Queen's. "We will be undertaking further tests between now and the start of the tournament, but we are very happy with the technology." ATP executive chairman Etienne de Villiers said the introduction of players challenging calls via Hawk-Eye on big screens has been "a great innovation". He added that he was keen to see the month-long grass-court season extended by a week if an already-crowded schedule could accommodate it. "There's something wonderful about playing on grass, and it's something that every tennis fan would like to see more of, " De Villiers added. Meanwhile, the Centre Court capacity is being increased by more than 400 to 6,858 and all additional seats will be made available to the general public.